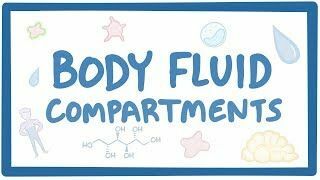 Osmosis: Body fluid compartments. (2019, April 20). Retrieved from (https://www.osmosis.org/learn/Body_fluid_compartments). On average, the body is comprised of approximately 60% water at any given time. This varies depending on gender and body composition, as adipose tissue contains less water than skeletal muscle and, in general, females typically have a higher percentage of adipose tissue when compared to males. Of this 60% water, approximately two-thirds is contained within cells in the intracellular fluid compartment. The remaining one-third is distributed in the extracellular fluid compartment which includes plasma fluid and interstitial fluid. This distribution is important because when solute concentrations are altered there can be a shift of water between fluid compartments leading to various clinical symptoms like edema. Isotopic water, like D2O or tritiated water, are used as a markers for (intracellular/extracellular/total) body water. A 70 kg man is administered inulin. Because it is freely filtered and not secreted or reabsorbed, inulin offers an accurate calculation of GFR. Inulin would be found in what amount of this patient's body water? Water is the key to life, and it takes up a big proportion of our body weight, typically around 60 percent! The precise amount of water depends on a person’s body composition. Since fat doesn’t store any water, a person’s water content is inversely proportional to a person’s fat content. So a really muscular and lean person would have a relatively high proportion of their body weight made up of water. Additionally, females tend to have more fat than males and so on average tend to have lower proportion of their body weight made up of water. Total body water can be subdivided into two major compartments, intracellular fluid which is fluid inside cells, and extracellular fluid which is fluid outside of cell like in the blood and in the interstitial tissue between cells. Assuming that the total body water is about 60% of their body weight, roughly 2/3 of that, or 40% is intracellular fluid, and the other 1/3 or 20% is extracellular fluid. This is also known as the 60-40-20 rule. Intracellular fluid is important for dissolving cations which are molecules with a positive charge, and anions which are molecules with a negative charge. The major intracellular cations are potassium (K+) and magnesium (Mg2+), whereas the major anions are proteins and organic phosphates like ATP. Fluid compartments always maintain the same concentration of positive charges as negative ones in order to stay electrically neutral - that’s called the principle of macroscopic electroneutrality. So for example, the K+ in the intracellular fluid is balanced out by negatively charged proteins and organic phosphates. The extracellular fluid can be subdivided further into interstitial fluid, which is the fluid that can be found surrounding the cell, and plasma, which is the aqueous portion of blood. The major cation in extracellular fluid, both in the interstitial fluid and in the plasma, is sodium (Na+) and the major anions are chloride (Cl-) and bicarbonate (HCO3-). Now, the plasma makes up about 55% of the blood, while the remaining 45% is mostly made of red blood cells, white blood cells, and platelets. Plasma is made up of around 90% water and 10% proteins like albumin which help transport hormones and minerals. Interstitial fluid and plasma are really similar, and that’s not surprising since plasma leaks out of the blood and goes into the interstitium through tiny pores between endothelial cells in the capillaries. These tiny pores between capillaries lets small solutes and water to pass through but block large proteins and cells. In fact, because some proteins are too large to pass into the interstitium, a phenomenon called the Gibbs-Donnan effect helps the plasma remain electrically neutral. This Gibbs-Donnan effect is when the abundance or negatively charged large proteins repels smaller anions into the interstitium while attracting small cations into the plasma. So compared to the plasma, interstitial fluid tends to have higher concentrations of small anions like Cl- and lower concentrations of small cations like Na+. Ultimately, the difference between plasma and interstitial fluid is small, whereas the difference between intracellular fluid and extracellular fluid is quite large and physiologically important. For example, Na+K+ ATPases help to establish a high concentration of K+ inside the cell and a high concentration of Na+ outside the cell. Establishing these differences between intracellular and extracellular environments is incredibly important for allowing cells like neurons to fire action potentials, among many functions.